Basilio Izquierdo: “Twenty years ago grapes were better, now there’s more technology”. The wine tasters’ club run by lomejordelvinoderioja.com, the online wine information site sponsored by our local newspaper LA RIOJA, closed out its 2014 tasting series by inviting Basilio Izquierdo, one of Rioja’s most talented winemakers, to show his latest wines. 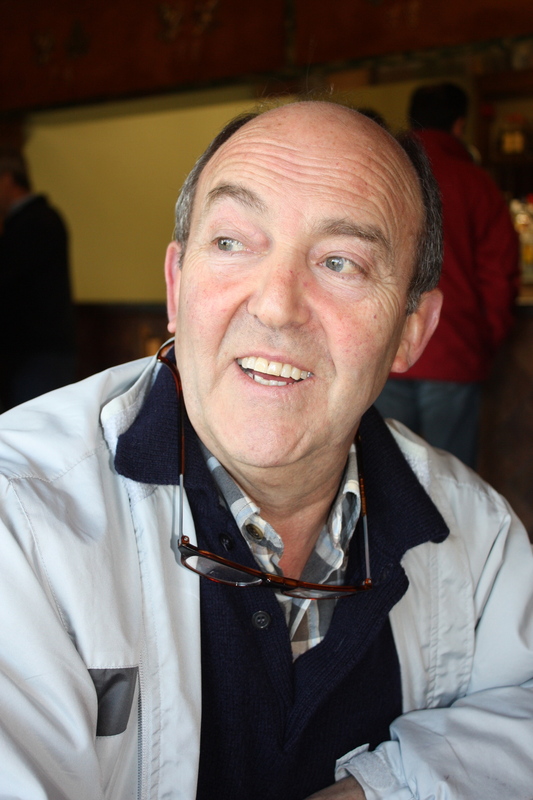 Inside Rioja interviewed Basilio a few years ago and has already reviewed a tasting so I won’t go into details about his past, but rather focus on his recent experiments, accomplishments and musings. For those of you who don’t know Basilio personally, he’s one of the most modest, unassuming guys I’ve ever met in spite of having kept very fast company throughout his career including studying enology under Émile Peynaud in the same class as Michel Rolland (they’re still very close) and inheriting the chief winemaker’s position at CVNE following the departure of Ezequiel García (‘El Brujo’) to Bodegas Olarra. Basilio showed us five wines: a sparkling ‘metodo tradicional’, two vintages of his white ‘B’ de Basilio (2011 and 2008) and two vintages of red ‘B’ (2011 and 2008). The idea was to show off the latest vintages on the market against the 2008s, his second vintage after leaving CVNE. The sparkler is a 2009 blanc de noirs brut nature made exclusively with red garnacha from the Najerilla valley (Rioja Alta). Very pale yellow, almost colorless, fine, persistent mousse in spite of being served in a wine glass, a delicate aroma with hints of nuts and graham crackers, and creamy on the palate. Only 400 bottles were produced to be given away to friends because at least for the time being, it can’t be legally sold. Laguardia, the site of his winery, isn’t included on the list of villages approved for the DO Cava. Basilio felt strongly that the DO Rioja should allow sparkling wine and raise the requirements bar with respect to cava. I agree and think his 2009 is easily as good as vintage champagne and lots better than practically all the cava reservas I’ve tasted. The sparkler was big surprise and for me, the best wine in the tasting. ‘B’ de Basilio 2011 made with white garnacha (70%) and viura (30%), fermented and aged for nine months in new French oak is straw yellow, shows floral and tropical fruit notes on the nose, vibrant acidity, luscious with tropical fruit on the palate and a long finish. ‘B’ de Basilio 2008 (same varieties, same proportion) is a deeper yellow with pronounced wild flower notes (chamomile to me) good acidity, but in my opinion could be a little more ‘zingy’ (I guess that’s to be expected in an 8 year-old white) and an extremely long finish. It has evolved in complexity and is tasting very well. 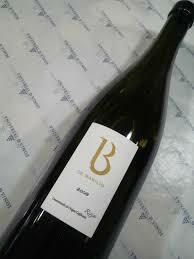 ‘B’ de Basilio red 2011 (bottled in September 2014). (± 60% tempranillo, 40% garnacha, 3-5% graciano) Color: medium-high intensity black cherry; acidic red fruit (cranberries to me), spicy; good acidity, pronounced tannicity but elegant, will improve in the bottle. ‘B’ de Basilio 2008 (same varieties, and percentages as 2011). Medium intensity black cherry, complex nose featuring red and black fruit, lipsmacking, ripe, round tannins. Basilio likes to use a high percentage of garnacha because of its smoothness on the palate. He regrets that so much old vine garnacha, especially in Rioja Baja, was pulled up in favor of tempranillo. In his opinion, this happened because growers favored the low maintenance of tempranillo to the finicky garnacha, prone to millerandage and coulure. The historic wineries in Haro used to own or rent vineyards in Rioja Baja for their blends but most of these were replanted to tempranillo. Since he didn’t mention his pet peeve about clones, we asked him about it. He’s adamant about not using grapes from vineyards planted after 1985, the year in which in his opinion, growers in Rioja made the mistake of massively planting a specific, high-production tempranillo clone. Before 1985, according to Basilio, winemakers could easily distinguish wine made from grapes from specific villages. He believes that these local differences, along with the widespread use of garnacha, produced wines of greater character than today’s in spite of the lack of technology. He contends that “twenty years ago grapes were better, today there’s more technology”, implying, I think, that what happens in the winery these days is seen by many as more important than what’s in the vineyards. It’s an interesting question for a future debate between the old guard and the Young Turks of Rioja. This entry was posted in Personalities, Wines I've enjoyed and tagged B de Basilio, Basilio Izquierdo, Rioja, Rioja winemakers by insiderioja. Bookmark the permalink.